What Hollow Chisel Mortiser Do you like and Why? 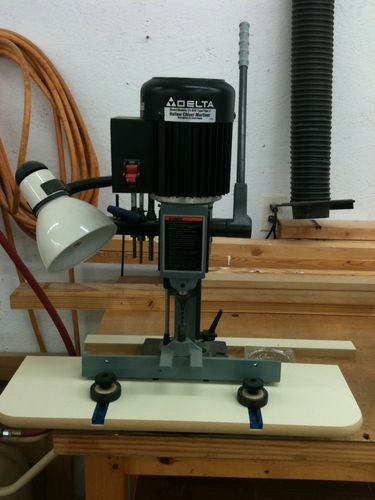 I have a Delta hollow chisel mortiser and it sure makes mortising easier, however the tool has been unreliable. I installed some new parts and got it working again, however there is a lot of slop in the handle. The head unit on the dovetail keys is nice and sturdy, however the handle swings 30 degrees before the chisel moves. The internal gear has a tiny allen screw that is supposed to limit the slop, but it doesn’t work well. So my question is WHAT MORTISER DO YOU LIKE AND WHY? I have a nice spot on my bench for the mortiser, so a benchtop unit is appealing, however I am interested in freestanding mortisers as well. From my own reviews, the General international and the Powermatic look promising. I especially like the idea of the rolling stock supports. Willie, sorry to hear about your difficulties with the Delta. I have the same unit, and it’s worked well so far, no mechanical issues. I’ve only had it a year, but I do use it a lot. Actually, I use it enough I’m starting to think about replacing it, also with a floor standing model. My big gripe is in work holding and setting the fence. The benchtop models all seem to have pretty poor system to hold the work steady and for setting the fence with any precision. Lots of trial and error setting up the cut, and a pain to do longer mortises. Oh, for a good X-Y table. My other idea is adding a homemade x-y table. I have the Powermatic 719T which is the floor model that has the tilting table. Its a very nice machine. Quite expensive for the number of times that I use it, but when I need it, its perfect. I like the table on it, it’s accurate, and its easy to change chisels etc. I have it on a mobile base so I can pull it out to use it. I am just starting a hope chest that is all mortise & tenons so its going to get a workout shortly. I have the Delta (mod.# ? ), but it’s the old Type II, bench top, and I’ve had it about 13-14 years…..not one single problem with it….Everything works just fine on it, and it’s not that hard to set up. About 2 years ago, I bought the table and fence that i have on it now from Rockler….Don’t know if they still make or carry it anymore, but it made a big difference in how the performs…..with the rollers pushed up next to the stock, but loose enough to slide the part, and the hold-down arm in place, it does the job….it was a big improvement….. here’s a pix of it ready to go…....!!!!!!!!!! models and I suppose the rest of the build is tougher and heavier too. will crop up on the second-hand market sooner or later. bought it new, but being the second owner I can’t complain. I shopped these about ten years ago and ended up with the Jet (benchtop) because at the time all the others ran at 3450 and the Jet turns 1725. The result is less heat in the chisel-bit realm. Ergo sharper. Nice tool, robust, dependable.